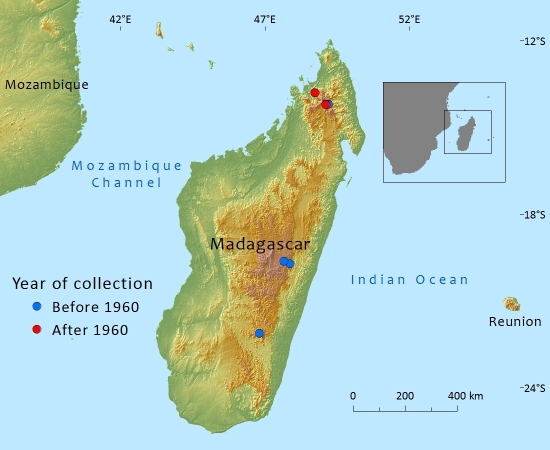 Endemic to Madagascar in the Provinces of Antsiranana, Fianarantsoa, Mahajanga and Toamasina. The population is thought to be decreasing and subpopulations are severely fragmented. Podocarpus rostratus is recorded from rocky slopes on silicious rocks; the elevation is given as 1800–2400m above sea-level, but the range may be greater according to GIS calculations and information from literature. It occurs in ericaceous scrubland near the summits of mountains, a vegetation type prone to fires. It is not well adapted to fires and therefore occupies either open, rocky places with little vegetation, or wetter sites along streams. The area of occupancy here calculated may already be much less in the field, as some localities are based on herbarium collections of the past, where it has not been collected since. There is no doubt about the continuing decline, so the species meets the criteria under B2 for Endangered. 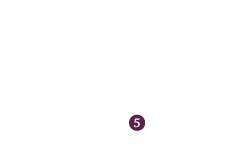 This species is known from three highly disjunct subpopulations. The greater number of herbarium collections is from the northern population and only one from each of the eastern and southern populations (to over 1000km away), made in 1924–25 at locations which have probably since been deforested. All but one collection are older than 50 years. The area of occupancy (AOO) of the northern population is less than 500km² and only one sub-population is inside a protected area, a collection was made there recently (2005). Serious decline of small subpopulations is therefore inferred for this species, which is susceptible to fires. One locality is in a protected area near Sofia in Mahajanga Province. Leroy, J.-F. (ed.) (1972). Flore de Madagascar et des Comores. Museum National D'Histoire Naturelle, Paris. A.Farjon, 2015. Podocarpus rostratus, from the website, Threatened Conifers of The World (http://threatenedconifers.rbge.org.uk/taxa/details/849).